With rubber bushings. Quantity of needles: 496; Diameter: 51 mm (2.008 in); Width: 72 mm (2.835 in); Step: 3,5 mm (0.138 in). Owing to optimum dimensions of the work surface and the distance between the needles, this applicator is used for treatment and diagnostic in all the age groups and is applied to any part of the body. Rollers are applicators for dynamic massage. Using them you can work on all parts of the body: the back, chest, abdomen, extremities, the zone of back sides. With rollers therapeutic effect can be achieved quicker than with static applicators. You will need an assistant to work on the back and other hard-to-get-to areas of the body. Lyapko roller is intended for treatment and reflex diagnosis. Owing to the optimum size of the work surface and the distance between the needles the roller can be used by people of all ages. 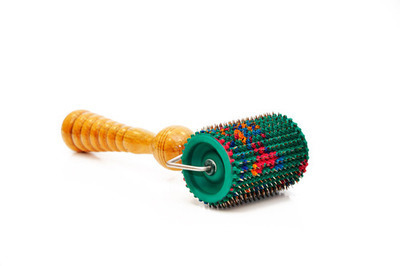 You can apply the roller to all parts of the body, but it the best to apply it to the areas with small curvature: the shoulders, neck, head, joints, upper surface of the foot, arm, and leg. The roller can produce sedative effect (for example, for pains in lumbosacral region or lower extremities) and toning up effect (for myoparesis). To produce sedative effect massage a bigger area of the body for 10-15 minutes. To produce toning up effect vigorously massage a smaller area of the body for 5-7 minutes. The needles of the roller are in contact with the skin but they do not damage it. The method is effective and nonivasive, so it completely excludes an infection carry (virus hepatitis, AIDS).